The Japanese Quarter in Dusseldorf houses around 6,500 people. The majority of the residents are Japanese, which includes Germans with Japanese heritage. The city has the third largest Japanese population in Europe, just behind Paris and London. Dusseldorf provides a base for hundreds of Japanese companies. It’s because of this that there are so many Japanese employees and their families living in the city. Over the years, these residents have established the Japanese Quarter. Commonly known as Little Tokyo or Japan Town, the Japanese Quarter in Dusseldorf is filled with oriental charm and amazing food. It’s a thriving but peaceful part of the city centre and is the base for large percentage of Japanese businesses. If you want to immerse yourself in the Japanese Quarter in Dusseldorf, this is the place for you. The main area runs from Berliner Allee to the Haupbanhoft (central railway station). It’s not uncommon to enter the Japanese Quarter and hear no German being spoken. In addition to Asian and Japanese supermarkets here, there are nail salons, bakeries and travel agencies. It’s a fantastic place to enjoy traditional Japanese cuisine in the heart of the city. Sushi and tempura are mainstays of the menus and there’s a wide selection of restaurants and cafes to choose from. In addition to food, why not try out the amazing selection of bubble teas available at Sphere Tea Manga Cafe? The primary function of EKO House is the progression of East-West relations in the city. It also promotes Japanese culture, which is especially relevant in Dusseldorf. In addition to having an international nursery on site, there’s also a Buddhist research facility and a large library. This consists of three departments, devoted to music, visual arts and literature. Locals (and tourists) are encouraged to visit the house and enjoy the facilities. Next to the EKO House is the largest Shin-Buddhist Temple in Europe. The facility is often used for concerts and events and has a pretty house, tea room and small garden. The temple is open to the public and residents and visitors are actively encouraged to learn more about Japanese culture. The grounds are immaculate and, if my garden at home looked like this, I’d honestly never leave because OMG. This pretty attraction isn’t actually in the Japanese Quarter, but it’s well worth visiting because it’s so pretty. The peaceful garden is part of the larger Nordpark, which is a little north of the city centre. It incorporates so many traditional elements in its 5000 square metres. 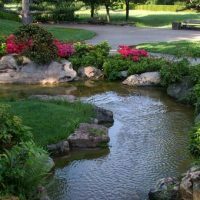 There are numerous Japanese pine and maple trees, in addition to colourful flowers, and a pond with lanterns and seating. Built as a symbol of the bond between Germany and Japan, the garden demonstrates how well the cultures have merged. The sense of serenity in the garden makes it the perfect place to escape the hectic pace of daily life. Have you visited the Japanese Quarter in Dusseldorf?